Similar to past years 2015 had an intensely packed schedule of art fairs and events. The foremost of which is the Armory show itself which this year hosted 199 galleries from 28 countries around the world. Other major art fairs included the ADAA show, SCOPE, PULSE, Spring Break, Independent, Art on Paper and Volta. Overall an excitingly exhausting amount of art, some good, some bad. At this year’s art fairs there was no shortage of whimsical pieces made of unusual materials or using innovative techniques. 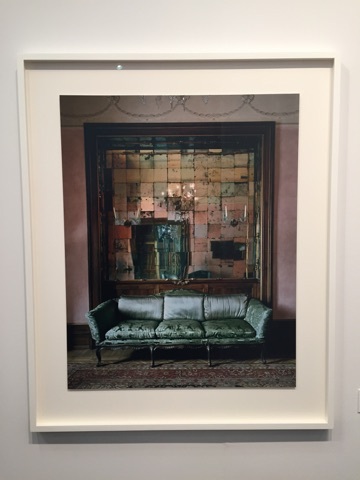 At the ADAA Art Show, Armory Show, and Volta we enjoyed works with the trompe-l'œil, illusionary quality that invites the viewer to take a closer look. This iteration of Le Rêve by Cameron Gray at Carl Hammer Gallery (Chicago, IL) is actually a skillfully composed mosaic of tiny florals. Three steps back, the eye combines them into the lyrical form of Picasso’s famous mistress. At Adler & Conkright Fine Art (New York, NY), a quiet, clever work on paper by Liliana Porter features a wire eyeglass frame collaged atop its silkscreened shadow (in the slideshow below). A large and intricate geometric pattern by Leonardo Ulian shown by The Flat – Massimo Carasi (Milan) initially appears to be a web of jewels, but further examination reveals it to be a network of electrical components. A cheekily funny work that could easily be passed over, were it placed almost anywhere besides at the center of a contemporary art collection, is Gavin Turk’s American Bag at Ben Brown Fine Arts (London) (in the slideshow below). Looking like a jumbo-sized black garbage bag it is an interesting statement piece for home or yard. Humble as it is, the label confirms it is painted bronze. One fair that stuck out of the crowd was Spring Break. Located in a derelict post office Spring Break is a curator-driven art fair started by Ambre Kelly and Andrew Gori in 2009. Unlike its counterparts this fair is focused on installations and experiential art and is definitely a bit more rough around the edges. We loved the Christine Sciulli Propulsion Field light installation. For many it seemed like an oasis away from the other gallery driven art fairs, one that was willing to experiment and even get a little gritty. Art fairs: just when everyone was saying there were too many of them, even in the summertime they won’t give us a rest. Received three invitations in one week to attend fairs in different European countries. How do they have the strength? Spoke to a young woman who’d been to a huge fair in Dubai and she says it was better organized than any she’d been to in US or Europe. I’ll take her word for it. OTE is not inviting you to an art fair. We don’t give them, just attend to check the pulse of the market. But for somewhat lighter entertainment we are going to share the link to our new website – no, not today – but soon. This is like a trailer before the show begins. It took a little extra time to receive permission from our artist clients or their estates to use their images. I hope you’ll find it was worth the wait. ‘tis the season of semi-hysterical hyperbole regarding the art market. Christie’s with its all-time all-star contemporary sale, the plethora of exhibitions, the panting over-the-moon prices for rectangles of canvas and sticks of synthetics. It’s exhausting and not altogether fun. The promoters say it’s fun, the publications say it’s an other worldly experience. The eye says it’s tired. Frieze was noisy and crowded with expensive foods and nothing extraordinary in the booths. Maybe the artists are tired too. They’ve been at it day and night to produce enough saleable stuff for all these fairs, 200 thus far and counting. We played “what four works do you remember from the show?” during dinner that evening with collectors and professionals. They were hard-pressed. Maybe they were tired too. For some reason, instead of recalling marvelous contemporary work I still see the Rauschenberg cardboard construction soaring on the wall at Gagosian’s. And the two Dennis Oppenheim drawings in a London booth. Why can’t I remember the more recent items? Great art holds up. Doesn’t mean the emerging artists don’t have some chance at immortality, or at least a mention in the art history books, and perhaps walking through the show with others isn’t the way to take the work seriously. And maybe that’s the problem with these big shows that are proliferating like dandelions in May. Perhaps the sheer size doesn’t allow us the opportunity to engage with the art in these 100 plus exhibitions where we tend to rush through, looking for that “wow” piece or the one we can chuckle over with our companions. And then there are always those satellite shows, some of them interesting but too many boring or bad. Now there are design shows as well as art shows. One recently at the pier on 15th Street (never been there before) was filled with chairs and tables and desks that required discussion, but there was relatively few people with whom to discuss anything- at least on opening day. The displays begged for signage, explanations, some sign that the sellers were interested in the pieces they were showing. But on the weekend, at the conference on Initiatives in Art & Culture I remembered why I had enjoyed the art world so much once. Put together by Lisa Koenigsberg, the two-day conference on American Art was filled with intelligent talks on a part of the art world that has been shamefully neglected for the past several years – art made in America from the 1700s into the mid 20th century. Perhaps if we called it “international art made in America” it might have a better chance. Much of the great art from our older American artists is in museums or important private collections, but there is a wealth of overlooked artists from the past. We may see a resurgence of interest in the discovery of these now obscure painters and sculptors of the past. But will collectors whose eyes seem blind to all but the one-stop shopping artist’s in your face creations find any excitement in the moderately priced homespun heroes of yesterday? And will their hearts beat faster at the prospect of not competing with the $50 million trophy? And does the $7.2 billion spent on art in 2012 have much to do with art? What struck me about the most recent AIPAD photography show last week was how black and white it was. I mean that all those oversize contemporary color photos that had so dominated past shows seem to have been kept in the closet this time ‘round. There has been so much to see since then that the illustrated cards I picked up and kept on my desk between then and now may or may not have been what I thought were the most interesting exhibits or just the ones that offered attractive cards. The naked Asian lady stretched out on a divan reading a book is a C-print by Gao Yuan from Throckmorton Fine Art, New York. Then there’s a famous photo of Jack Ruby shooting Lee Harvey Oswald on November 24, 1963 at Daniel Blau Gallery, Munich and London. Staley Wise Gallery in Soho was billing Bert Stern as the “Original Mad Man,” with a snap of the photographer sitting on a sofa next to a posed shot of Marilyn Monroe, hair askew, empty wine bottles and overturned shoes and cigarettes strewn about the floor. A sort of inside joke I suppose, made sad by what we know now. I know why I picked up the brochure from Scheinbaum & Russek Ltd, Exclusive reps of the Eliot Porter Estate, and that was the Eliot Porter images from the Great Smoky Mountains, Concord River, Massachusetts, and New Hampshire. If you are into color photography Porter says it all. And then there were the black and white frontal face portraits by John Kenny of African tribal members shown by Capital Culture, London. The intensity of expression in those otherwise still faces is both riveting and just a little scary. From famous photographers to the unknown emerging artists at the Affordable Art Fair held this year at the Metropolitan Pavilion on West 18th Street. Not much to say about that show since I apparently failed to pick up postcards, or perhaps they weren’t being offered (to cut down costs), but I do remember that that the 2013 version of how to fill the walls of your apartment without robbing your kid’s college fund was a major improvement over the 2012 offerings. The usual “looks just like” and “what’s affordable in this show?” struck me as I wondered through. I kept thinking of how many people want to be artists whether they have significant talent or not, and how easy it is to evade an answer with derivative creations. I was looking for crude but innovative or not-quite-there-but promising. Didn’t find it, but there seemed to be a lot of enthusiasm among the viewers and works to go were being wrapped up, so maybe I’ve seen too much over too many years and see the often dead famous artist in all those emerging artists, or maybe there are just too darn many art shows and we’re all getting tired. Last week disappeared in an art tsunami that left show-goers dazed and glassy eyed. Started with a private showing by Paul Morris, one of the Armory (revisited) founders who set up an exhibition of contemporary superworks in a gutted 1882 bank building on Beekman Street downtown. All the names the big collectors want to own given its own separate peeling walls space in a one-off (42 works) exhibition to reel in the biggie buyers. It’s Morris’ contention that the 200 per year art fairs have run their course and sellers must conceive a new direction. This is his. We must agree about people being weary of art fair crowds who appear more and more to party, while fewer come for the art. El Anatsui, Anish Kapoor, Ai Weiwei, Basquiat, Calder, Cindy Sherman, Dan Flavin, Yves Klein, etc. – they were all there in great form. The artworks I mean. And to speak of crowds – the lines at the Armory Pier Show Sunday were an hour long – to get in, to get from Pier 94 to 92, to get a taxi. The only quiet spot was the VIP Lounge where bottles of water cost $4 and a small tea was $3.50. At least it didn’t cost $80,000 for a (looks like styrofoam) melting 6-foot snowman artwork who stood guard outside one booth. I could see its amusement appeal if situated in the atrium of a Miami villa during a Basel Miami week party. Pier 92 was filled with first rate examples of art that revisited the 70s, the original Armory Show, the established names, and was a comforting and familiar sight for serious collectors. Probably more exciting than the ADAA exhibition at the 68th Street Armory, which had some really fine one-person sightings. Mitchell-Inness & Nash displayed a wonderful group of Arp sculpture, drawings and reliefs; “political pop” shouted from the walls of Mary Ryan Gallery with the Big Daddy portraits of grotesque men in various guises; Galerie Lelong surprised with the early paintings and works on paper (1975-1980) of Sean Scully, the kind of show that lets you see where an artist is coming from before he got here; another kind of surprise by Kiki Smith with her flat metal dogs, birds and flowers bolted to the wall; and the leaves of ore of Tam Van Tran whose fluttery leaves adhered to panels occasionally flutter off the backing (as the artist intended), but did he intend an endless departure? Mystery to me. At Sean Kelly Gallery a Mapplethorpe photo of Roy Lichtenstein, from an edition of 3, was available for $40,000, and at James Goodman Gallery a large classic pencil drawing of a woman by John Graham was available for $250,000 while a large painting of two men by the artist dominated another booth at $3.5 million. A small “Elegy” painting by Motherwell looked inviting at $750,000 at Lillian Heidenberg Fine Art, and at Pace Prints a Barnett Newman silkscreen on plexi on wood, from an edition of 125 from 1966, was yours for $60,000. Probably an excellent purchase if you’re looking into the future. All right, we could go on and on and on. There was so much art to be seen around New York this past week it was overload for those whose livelihood derives from that source, which to others may be pure viewing pleasure. It makes for a very overcrowded eye, if there is such a term. If not, we invented it today. 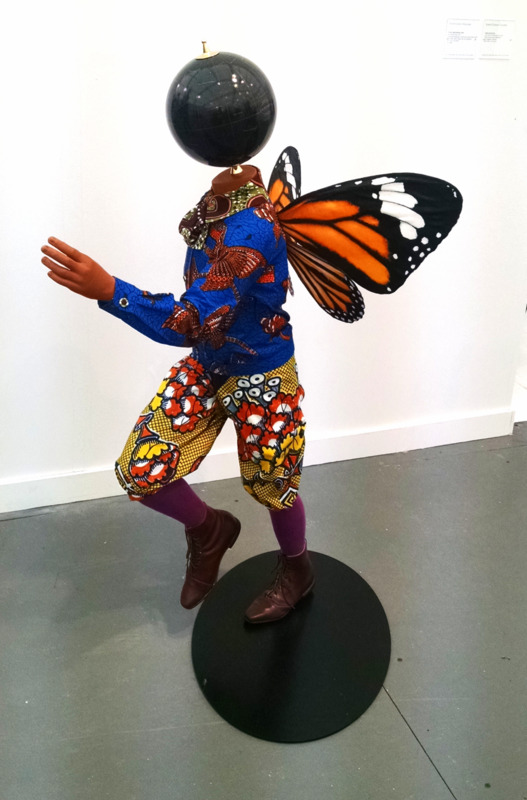 No question about it – this year, 2013, was the best ever for the Outsider Art Fair. Quality was up, as were the prices. Interesting to note that many of the more famous Outsiders, such as Bill Traylor and Thornton Dial, had not increased in price from last year (at least not notably), while virtual unknowns (except regionally), are commanding prices in the 20 and 30 thousands. Found the work and back story of Gayleen Aiken particularly fascinating. Her work was featured on the first page of the NY Times Art Section on Friday the 1st, a cardboard replica of Gayleen’s imaginary family – 24 “cousins” together with her mother and father, each with a name and individual characteristics. These were her family and companions for years in her Massachusetts home. I was told by her art dealer, Luise Ross, that the artist would even bring some of the “cousins” on the porch with her so that she would not be lonely when she sat outside. At $130,000 (although they can be sold individually), the family would fit suitably into a museum collecting Outsider Art. The repeat pattern paintings of Winfred Rembert at Kinz & Tillou Fine Art was another interesting insight into the work of untrained artists, although somewhat optically challenging. Another repeat patternist was Josephe Jovelus of Haiti, at prices in the $2,000 – 5,000 range. But what really struck me was the similarity of Sylvain Corentin’s spirally plaster sculptures at the Cavin-Morris Gallery because they were so related to the spirally plaster sculptures of Enoch Perez, who is represented by major galleries in Manhattan. The difference is that an 86-inch work by Corentin is $6,700, while one by Perez is certainly ten or more times that. And the similarity between the outsize mud and stick and wood slat work of Bill Trayor and the outize mud and stick and wood slat work of Anselm Kiefer, all except the price. The Traylor’s were in the $65,000 - $75,000 category and the Kiefer’s are in the strasophere. I have to comment upon the size of the crowd, despite the fact that the Super Bowl was just short of kick-off. There were so many visitors that the catalogs had sold out hours before, and the place – the former DIA Foundation – was packed. It was noticeable that work was selling at a fast pace – a change from other crowded art fairs where there has been a lot more smoozing than selling. The LA Art Show brought in so many unexpected visitors that there weren’t any brochures or catalogs to purchase by 1 on Sunday, January 27th. The place was mobbed, primarily with an under 50 crowd of eager-to-look, not so quick to buy visitors. Or so it seemed. It was disappointing to those who were seeking to see familiar names or big gallery artists. This was a show for emerging artists, or artists who had been around a while but never could make it out of their home territory. One of my fellow travelers, a young woman who knew little about art (or so I thought) mentioned in a mild tone that the works seemed a lot like those of famous artists, but not quite. She meant derivative, and so right she was. Yet their prices matched those of artists in NY who had had a showing or two: $2,500 - $10,000. I came away impressed with how many more people have been exposed to art and who wanted to live with art than has probably ever been the case in this country. And it’s wonderful to see how many different nations and states participated in the fair, from Georgia to Germany to Nubia and numerous countries in between. Funny thing about art shows away from your home base…when you bump into an a professional acquaintance it’s like coming across your best friend unexpectedly in a foreign country. You can’t stop talking. Bump into the same person when you’re both in New York and it’s “hi” and pass by. Well, I’m delighted I went. I did bump into an old friend and came away with a ticket to the Maastrict Fair in March. So it was worth the traffic on the 101. At Christie’s, upon entering the exhibition I was offered an iPad loaded with short video clips of Christie’s specialists explaining the art historical significance of many sale highlights. Hearing the dialogue while standing face-to-face with the works tremendously enriched the preview, and I hope both auction houses expand on this practice. One of the stars of the Old Master sales at Christie’s was a rare, tiny canvas by Chardin, The Embroiderer, measuring only about 7 x 6 inches but worthy of its $3 - $5 million estimate (realized $4 million). Another gem-like painting displayed beside it was Watteau’s La Déclaration, about 8 x 7 inches, estimated between $500,000 and $700,000 (realized $600,000). Both are precious in size but powerful in execution. At the Winter Antiques Show, at least two strong examples of paintings by George Bellows from private collections were spotted. It looks like collectors and dealers hope the market for Bellows will heat up in tandem with his retrospective currently on view at the Metropolitan Museum. Asking prices reach into the nine digits. Art lovers were blessed with perfect weather last week at the 2012 Biennale des Antiquaires held in Paris’s Grand Palais. In its 26th year, the fair is the foremost showcase of art and antiques for dealers from the Société National des Antiquaries (SNA). In a venue designed by Karl Lagerfeld this year, dealers exhibited in lanes of two-storey white shop fronts, and there was no shortage of stunning antiques to admire. Amongst a healthy mix of old, new and Revivalist pieces was a rare, blue slant top desk varnished in the Chinese taste, by Pierre IV Migeon and the “frères Martin,” France c. 1735 offered by Anne-Marie Monin (Paris), an ornamented walnut and marble cabinet by Édouard Lièvre c.1875 offered by Galerie Marc Maison (Paris), and an 1874 Emile Reiber rosewood, ebony, walnut, gilded and silvered bronze corner cabinet with enameled cloisonné offered by Oscar Graf (Paris). While galleries such as Richard Green (London), Galerie Mendes (Paris) and others brought striking examples of Dutch floral and Old Master work, the fine art leaned toward European Modern and Contemporary. Italians Lucio Fontana and Georgio Morandi appeared beside the French: Yves Klein, Fernand Leger, Simon Hantai. One stand-out was Galerie Patrice Trigano (Paris) showing a selection of still life paintings by the self taught Séraphine de Senlis. The man of the hour? Fellow primitive Jean Dubuffet, with pieces being offered by no fewer than 20 galleries including Galerie Zlotowski (Paris) whose booth featured Dubuffet en Papier, a grouping of the artist’s works on paper. Last, but certainly not least were the jewels. Cartier, Van Cleef & Arpels, Dior, Bulgari, Piaget, Siegelson (New York), Chanel, Boucheron (Paris), Chaumet (Paris), and Wallace Chan (Hong Kong) - the list goes on. If you were looking for sparkle, one couldn’t have asked for a better venue. Spirits (along with Mr. Lagerfeld’s balloon) seemed high. True to its lustered reputation as the must-see and must-be-seen destination for serious art enthousiasts, the 2012 edition of the Art Basel fair was buzzing with business. Gallery booths elegantly displayed large-scale works by top modern and contemporary artists. As if every dealer had simultaneously thought of a "Less is More" aesthetic. It worked. No idle dealers spotted – everyone seemed busy with a client or engaged with the screen of their iPads. With the type of serious transactions realized and potential for future sales, a fair of this caliber can represent up to 70% of a dealer's yearly revenue. In contrast to people-friendly art fairs held in the US, the Art Basel fair is a controlled environment peppered with security guards, check points and no photography permitted. That seemed to work as well. In a strange way this type of elitism makes for both man and art to be equally treated as VIP's.